playing chess with people's lives. Don't you wonder why Israel and Hamas are playing the same game that kills many and accomplishes little? What's it all about? 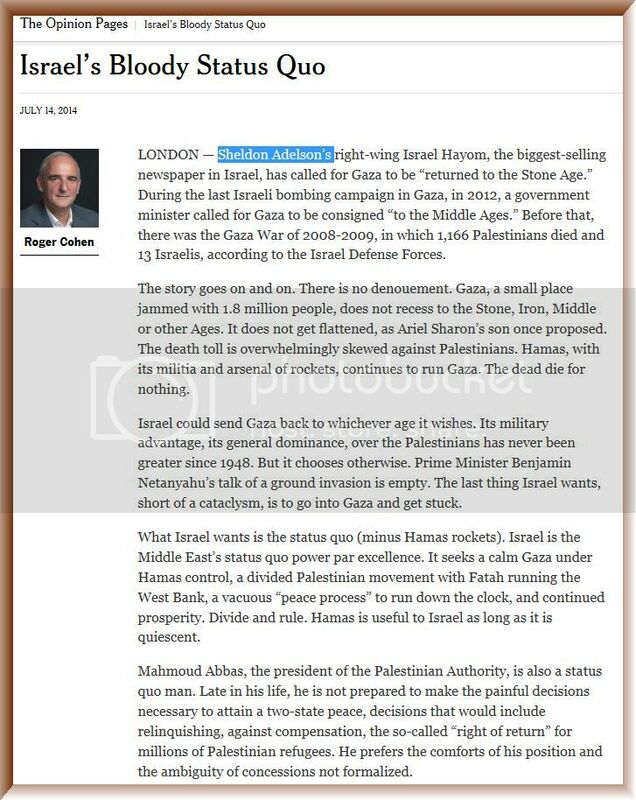 Behind the scenes is just your average billionaire, Sheldon Adelson, (just like Rupert Murdoch) stoking the flames of war (via newspaper propaganda) upon the innocent. People, who want only to live, work and raise a family (human instincts), are used in the quest for power by those who have the dollars (billions of them) to twist and reshape reality to fit their own greedy agenda of achieving world dominance over the masses. The multitudes cant fight back they can only run and hide to save their families (they are out resourced in everywhichway but loose). The oligarchs like Adelson (and the world's oligarchy leadership) seem to win in the short-run but they can never achieve permanency for long because, I believe, this is not natural and Nature cannot support an abnormal state for long. I know this sounds too simple but that's my opinion and without a doubt I'm dreaming but it is too damn depressing to think otherwise.